Betaa Fish Plants – Roots in Water – Will it Grow? It’s funny how something new (or old) brings up questions in a person’s mind. Recently, I have noticed some e-mail that has come across the computer screen that I haven’t seen before and wanted to address it. I’m not going to get very technical, and want to post more of a "word of caution". Here it is. This e-mail has dealt with the issue of growing plants in water – ONLY. I purchased a spathiphyllum which is placed in a vase with roots submerged in water. What variety of spathiphyllum lives in water with no soil? 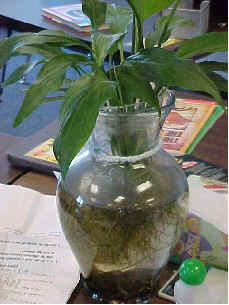 Another variation is this: I received a plant in a clear glass vase with the glass marbles used as the "soil". What kind of plant is it and will it live? One of the greatest causes of death to a plant is – over watering. If this is the case how can these plants survive? Plants are an amazing creation and can adapt to a wide variety of situations. The key to all of this is the root system and growing techniques. These plants didn’t start out this way. The root systems in their search for moisture have been able to adapt to living in total submersion. I am not aware of any growers in South Florida at this time but 30 years ago there was a grower that produced spathiphyllum – little 4 inch bare root plants just for the aquarium trade. He shipped them out by the thousands. Some of you have taken the vacation trip to Disney World and visited Epcot Center’s – The Land – and have seen first hand tomatoes growing in air with nothing but regular misting. If you haven’t seen the exhibit and you get the opportunity, take the time to do so. It isn’t uncommon to see plants growing in nature along river banks to drop their roots in for a drink and have both roots above and below water. As I said, plants are amazing creations. These roots differ in that you won’t see them having large roots that support and stabilize the plant, they are there helping supply moisture and nutrients. Plants growing in this environment are also very sensitive to environmental changes. That can be changing the water or even adding new water, which can include chlorine or flouride. These plants would suffer greatly if their roots were exposed for any length of time (minutes) to the dry air which they are not adapted to. Stick to growing plants the traditional way, pots and soil. Hey, if you want to try growing plants in water only, go buy a 4 inch golden pothos and take some cuttings. If you want to take one of your plants, remove it from the soil, wash it, and drop it in water; be prepared for a short lived plant life. A better alternative is to investigate subirrigation growing. Plants grown completely in water are generally a novelty item, not a plant to enjoy for the long haul. Learning What Plants Need To Grow? I have had a peace lily growing in water only sitting on my desk since 2001. The plant does well and has survived the lifespans of 3 betas and is on its 4th fish. It flowers usually once a year with a single bloom. At one point, the root ball got so large I had to trim it back as it was overtaking the entire vase, but it continues to survive and look nice. It seems to derive all it needs from the fish and the fish from it. I usually change the water every 6 to 8 weeks and use spring water when I do. The water volume of the vase is approximately 1.5 gallons. My leaf tips are are brown at the end and I see that misting the leaves occasionally may help that, but other than that the plant seems healthy and happy. I simply do not understand how you recommend not growing these plants in a water vase with a fish. The care required is minimal and they make a great desktop accent. Why Brown Tips on Peace Lily? NO Flowers on Peace Lily? Droopy Spathiphylliums What Does It Mean?